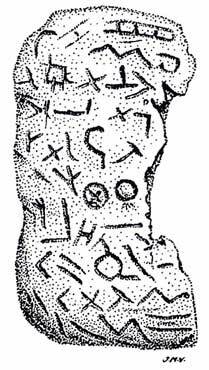 A tablet from Glozel, France, also from Magdalenian times, with clearly marked letters of some sort. A tablet from Glozel, France, also from Magdalenian times, with clearly marked letters of some sort. This tablet, although vouched for by many authorities of prehistory, has been attacked as spurious, possibly because its acceptance as authentic would imply a sweeping re-evaluation of established theories.